1. 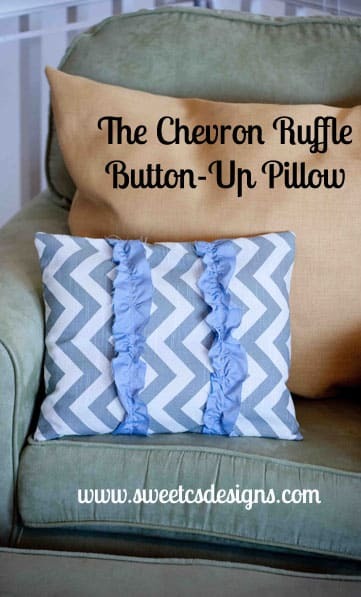 I am a sucker for pillows, and this one from Sweet C's Designs combines two of my loves- chevron prints and ruffles! I also adore the clever way she makes the cover removable--using an old button-up shirt! Go check it out for more details! 2. I'm in love with this Tiered Organizer from Scene of the Grime. She made this from old tin lids! (Think of all those cookie tins you have, or that they sell at thrift stores!) I especially like her fun, funky paper choice, but you could use anything to make it your own! 3. If you have boys, you know that sometimes it can be hard to find cute things for them. I really wish I had had these Argyle Burp Cloths from Rips in My Jeans for my two boys- they are super cute, perfectly boy-ish, and easy to make! This will stay in my file for future baby gifts! Thanks for the inspiration, ladies! Grab a featured button if you like! Thank you, thank you, thank you for featuring my Argyle Burp Cloths! You've got yourself a new follower!